All downloadable resources for X-toaster are linked from this page. If you need other documents please contact us. 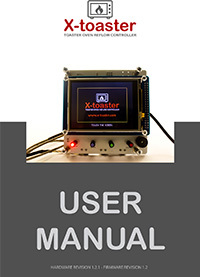 If you want to share your own X-toaster based Reflow Oven build guide send us an email, we'll be happy to post it here. An elegant metal chassis build... with a touch of colour. It is usually possible to fix any damage without the needs to send the board back to us. We will do our best to help you revive your board in the shortest time and with the minimum expenses possible. Please contact our customer support for more information. Please do not send the controller back to us without our specific approval and without an RMA. X-toaster comes with a limited warranty of 12 months from the moment the board is shipped to the customer. The Producer (Breakdown Technology di Simone Turini) warrants that X-toaster will be free of defect in materials and workmanship. In case of a damaged or defective board, the Producer at its option may decide to replace or repair the board, or to refund the customer for the price paid excluding any shipping costs. If the product is to be repaired or if a new board has to be shipped to the customer, all the shipping cost shall be paid by the customer himself. The producer shall not be liable for any defects that are caused by neglect, misuse or mistreatment by the Customer, including improper installation or testing, or for any products that have been altered or modified in any way by a Customer. The Producer is not responsible to customer or any other person or third party for any damage caused by the use of the board, including but not limited to loss of profits, loss of data, revenues, sales, business. Any information contained in the manual, in the website or divulged directly via email shall be considered only informative and any use and installation of the product shall be tested and proved to be safe by the customer himself. 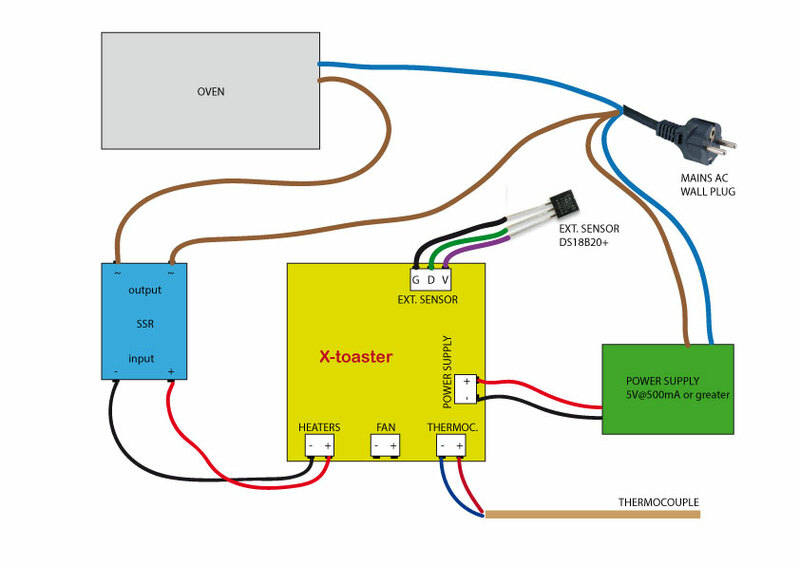 X-toaster is not an end user product, it shall be considered as a component to build some other device. The operating conditions and safety of those devices are under the direct responsibility of the customer himself. The Producer may change the specifications and product descriptions at any time, without notice. The producer shall have no responsibility whatsoever for conflicts or incompatibilities arising from future changes to them. The product information on the Web Site or Materials is subject to change without notice. Do not finalize a design with this information: if you intend to mass produce a device based on X-toaster you should first contact us. Customer understand and agrees that X-toaster is not designed for use in safety-critical applications where a failure of the product would reasonably be expected to cause severe personal injury or death. X-toaster is neither designed to be used in military, aerospace, automotive and medical applications. Customer acknowledges and agrees that any use of X-toaster is solely at the customer's risk, and that customer is solely responsible for compliance with all legal and regulatory requirements in connection with such use. 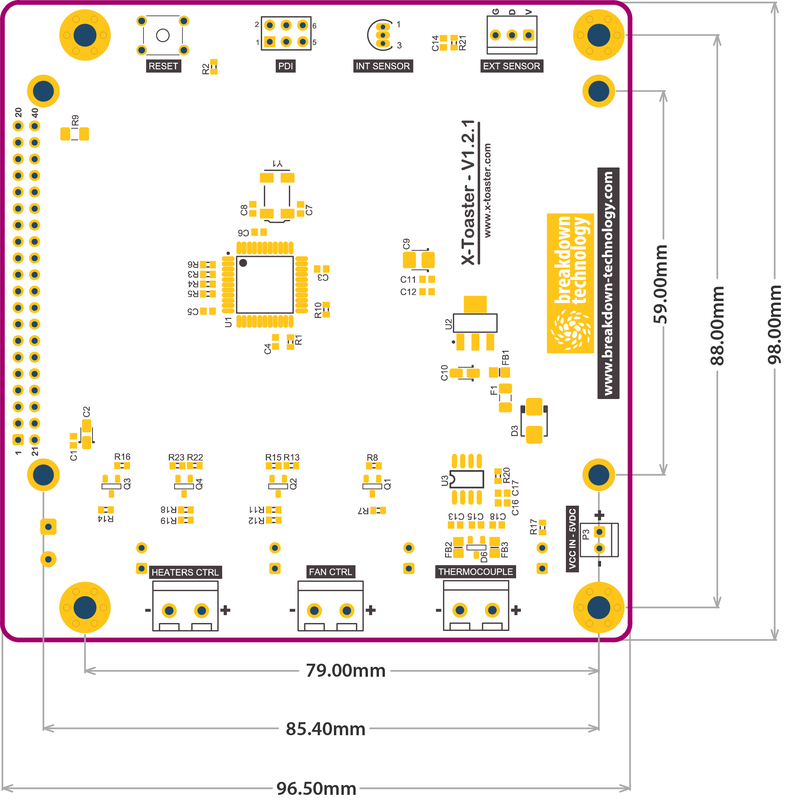 This board is intended for further engineering and/or development, it is not an end user product. As such it was not put into any testing and it may not comply with some or any technical or legal requirement that are applicable to finished products including, without limitation, directives regarding electromagnetic compatibility, recycling (WEEE), FCC, CE, or UL (except as may be otherwise noted). Breakdown Technology di Simone Turini supplied this development product AS IS, without any warranties, with all faults, at the buyer's and further users' sole risk. The user assumes all responsibility and liability for proper and safe handling of the goods. Further, the user indemnifies Breakdown Technology di Simone Turini from all claims arising from handling or using of the product. Due to the open construction of the product, it is the user's responsibility to take any and all appropriate precautions with regard to electrostatic discharge and any other technical or legal concerns. The product described in this document is subject to continuous development and improvements. All particulars of the product and its use contained in this document are given by Breakdown Technology di Simone Turini in good faith. However all warranties implied or expressed including but not limited to implied warranties of merchantability or fitness for particular purpose are excluded. All documents, manuals and informations on the website regarding X-toaster are intended only to assist the reader in the use of the product. Breakdown Technology di Simone Turini shall not be liable for any loss or damage arising from the use of any information or any error or omission in such information or any incorrect use of the product. Please note that while the board itself works with low voltages, mains power voltages may be involved when mounting and using it. High voltages can be lethal and in the worst case may lead to electrocution and death. It is assumed that you are a competent engineer and you know what you are doing. If not, please do not buy and/or use this product or search for a trained technician in your area that can help you. X-toaster is not an open source project, nor in its firmware neither in its hardware part. As such, you are not allowed to copy or imitate any part of X-toaster including but not limited to its exterior appearance, GUI, electrical connections and board layout, firmware funcionality and any other features exclusive to our product. Any attempt to copy, crack, distribute code or informations without any previous specific agreement from us will be persecuted by international laws. 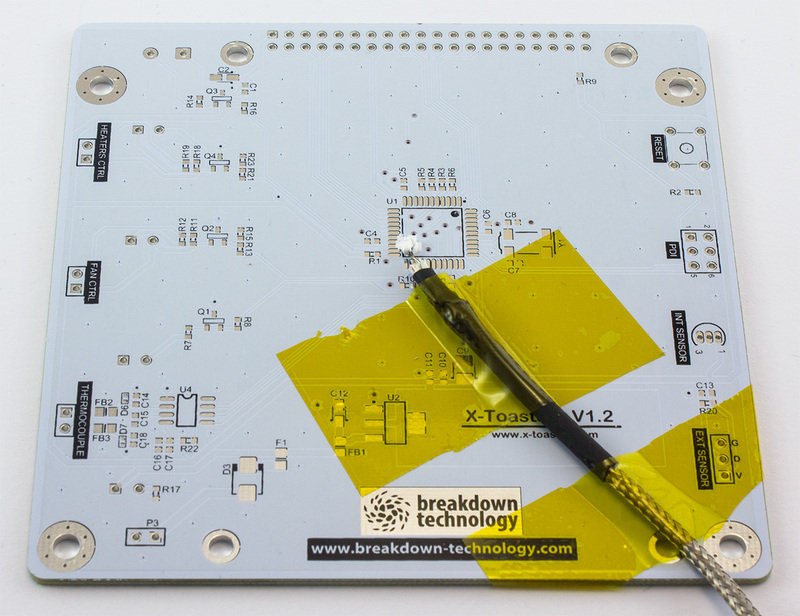 Every X-toaster board is extensively tested so you shouldn’t have problems with your board. Please check your power supply, it should be rated 5V@500mA. The board itself is usually drawing a maximum of 300mA so you should also be ok even with slightly smaller adapter. If the power supply is ok you may have a damages fuse or rectifying diode. If that’s the case you can substitute them (D3, F1) with a low drop schottky diode in the DO214AA package and with a 375mA fast fuse in the 0805 package. After substituting them we suggest you to check what damaged those components and, eventually, to change your 5V power supply. This may be a power supply issue as well. Make sure to use a good quality, stable power supply. Another reason may be some kind of EMI interference or coupling. Try repositioning your oven, make sure to have all metal part connected to earth and consider using a shielded external housing for your board. A metal enclosure connected to ground should be enough. Depending on the SSR you are using this may also be a source of interference: try mounting the SSR in a different case or inside the oven itself. Also try repositioning your power supply. A power supply problem while eeprom is written may result in corrupted eeprom and data. 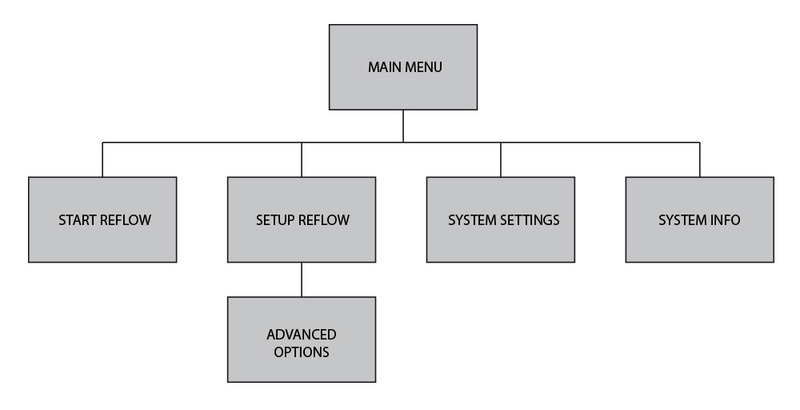 Try restoring everything to default in the “System Settings” screen. If it doesn’t solve the problem you may have to erase completely the device eeprom. For that pourpose you can use an Atmel programmer and, within Atmel Studio, make a complete erase of ONLY the eeprom content. During next power up of the board, firmware will detect the empty eeprom and will rewrite all needed data. Firstly check again every single connection. Disconnect everything from main power and use a multimeter to check them. If your wiring is ok try connecting the heaters directly to main power bypassing the SSR: if they are powered the problem may be the SSR itself. Please note that some chineese producers often derate the minimum voltage needed to turn them on so, a 3V~32V SSR may probably need at least 5V to work properly. If you find that this is your case you can get another SSR (maybe from another producer) or you can bypass the rectifying diode D3, which provide a 250mV dropout from 5V power supply, with a short thick wire. In our test this is usually enough to be able to use every SSR on the market. As an alternative, if you know how to build one, you can assemble an external non inverting circuit with a BJT or a MOSFET to amplify the on/off signal from the board. In this way you can also use another higher voltage source (12V usually) dedicated to your SSR. Maybe you are leaving your thermocouple in free air. If you do not use a testing board of sizes and layout similar to the one you are reflowing, your thermocouple may read temperatures very different from the one you have on the reflowed board. There may be overshoots of 20/30°C thus leading to burnt boards. Make sure to use a proper test board and to secure the tip of the thermocouple to a via or a plated hole possibly connected (and near) to the GND plane. Use a small quantity of thermal compound to ensure a good thermal transfer between the probe and the board and secure the thermocouple to the testing board with a couple of strips of kepton tape. Also make sure that, when you open the oven’s door, temperature is dropping fast enough to remain into the JEDEC maximum time limit above liquidus. If not, you should use some fan or other ways to let your board cool faster. If you have a fixed and stable error on your reading this is something that can simply be resolved by compensating for it in the “System Settings” screen. If the errors comes out in an unpredictable way with very small or very large values this is definitely an EMI issue. MAX31855 is very sensitive to EMI and, though we made our best with the layout and the filtering components within the board, you will probably have to take more measures to improve shielding. In our test we have seen that while most of the spectrum is affecting the chip readings, most of the interferences come from the microwave zone (cell phones). 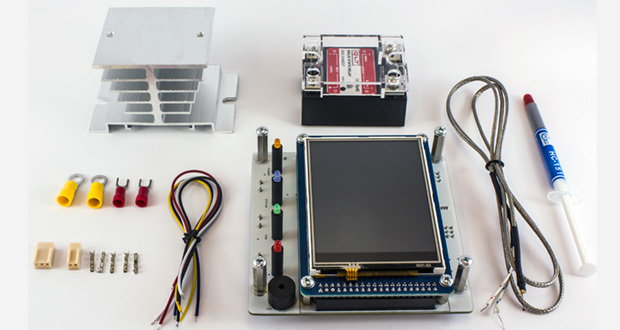 Mount the controller into a grounded metal chassis, shorten thermocople wire as much as possible and avoid any coupling from the thermocouple itself and other source of interference (for example high voltage wires) by keeping them as far as possible. If your problem is still present, please send us an email describing your specific issue, we will make our best to make your board live again or, if not possible, to repair it at the lower possible cost. Also check the "Warranty" section. I is calculated by multiplying a Ki constant with the sum of all the errors measured during time (if you draw a graph for the "error function", I will be the area under the graph itself, hence “integrative”). If you can visualize it in a graph you can easily recognize it as the derivate of the output function over time (supposing a very small interval between measurements): it tells us how big is the slope of the tangent line to the "output function" for every single moment hence how fast the output is changing. - What is the profile that you are going to use: temperatures and time intervals between each node. Because it is easy, fast, reliable and gives professional results with very little skills to master. While many SMD components can be soldered with just a standard iron this is generally a very slow process. It also requires some skills to be able to solder smaller components and high-density pins. Some footprints like QFN are very difficult to be soldered with an iron even for a trained technician and often those joints are not good enough even for prototyping purposes. BGA components are of course impossible to deal with and for them a reflow oven is a must. Reflow ovens are the first choice in the industry for production and prototyping, the only downside are their cost and the costs related to reflow technique: you are going to need a stencil for every board and you need to use solder paste which is generally quite expansive. Lately these costs, thanks to some Chinese production facilities and resellers (like Elecrow, SeeedStudio, ITead, etc…), have been lowered from several hundreds of dollars for a steal stencil to less than 20 USD, allowing even hobbyists to build devices with modern and difficult footprints. The only high cost device to buy is a reflow oven. Industrial ovens usually costs more than 1.000 USD and the cheaper Chinese alternatives on the market (which still are quite pricey, around 400/500 USD) are simply too buggy and do not have a build quality good enough for a reliable (and secure) use. 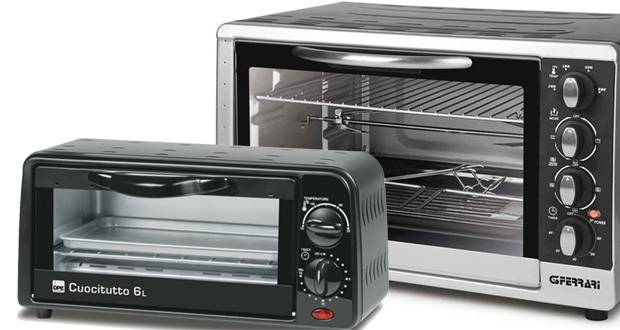 A toaster oven conversion is usually a much cheaper (and often better) alternative, but to be able to control the temperature to follow the suggested thermal profiles you are going to need a controller capable of compensating for the high thermal inertia usually related to cheap mass produced food ovens. These toaster ovens also transmit heat mostly by radiation than convection and this is another factor to take into account when building a controller. X-toaster has been designed to follow any reflow profile, to be adaptable to any oven and to compensate for inertia and hysteresis. When dealing with reflow soldering there are some things to know which usually are not needed when hand soldering with an iron. The first is that some components are sensible to thermal chock and the moisture content of their packages may be an issue. When you order some big microcontroller from Digi-Key or Mouser they usually come in a sealed bag with a humidity indicator and a desiccant pack inside. That’s because the moisture in the package when exposed to high temperatures vaporizes and, if you do not give this vapors enough time to exit the package, the result could be a cracked microcontroller. This lead to the first rule: only open these packing when you are going to solder them on the PCB and check the indicator that the moisture has not gone over the maximum allowed percentage. If you have a lot of components to be soldered in many PCBs during more than one day, always use an ESD safe sealed bag and keep them in it, with the indicator and the desiccant. If you have some sensible components sitting in a box for more than a few days you should try to let the moisture in it evaporate gently before attempting any reflow. X-toaster comes with a preprogrammed desiccant profile to keep the components at 125°C for 60/90 minutes. Even so keep in mind that this is not an ideal process and that micro fractures could be forming. It may be quite difficult, even with big professional ovens, to keep a uniform temperature across the entire PCB. When using a toaster oven this problem can cause some serious issues like pads where the solder paste do not reflow correctly or, even worst, components which overshoots the target temperature. Moreover, since in the toaster ovens the heat is transferred mostly by radiation, remember that bigger black components heats faster than smaller ones. Ideally you should measure temperature over the entire board and across every component to be sure to have a profile with a peak temperature high enough for reflowing but not too high to cause thermal shock on the bigger components. If you get unsoldered pads but you are already hitting peak temperature try to make your profile last a little longer for every phase (while keeping it inside the maximum limits). This is usually enough to have the entire board heat mostly at the same temperature. A convection fan may help in spreading the heat with more uniformity: if your oven have one make some experiments turning it on for one or more phases of your profile. Check the tray you are using to sit the PCB inside the oven. The standard toaster oven tray (simply made with steel bars) sometimes absorbs too much heat and you get cold strips where the PCB come in contact with the tray bars. If this is your case build another tray with some steel mesh or try to raise the PCB from the tray with some metal spacers. When designing your board keep in mind that large ground planes absorb much more heat and inertia may cause the pins sitting directly on these planes to overshoot. If you have such problems do not put your pads directly over these planes. Instead connect them with short tracks and eventually try to use thermal reliefs. Until a few years ago, every solder joint were made with Sn-Pb alloys and everyone where quite happy about it. Then someone started to think about all the electronics discarded in the bin every day by billions of people and the consequent lead pollution. This (and a few other reasons) brought to the concept of RoHS and lead-free electronic and the Sn-Pb was substituted with other alloys like Sn-Ag-Cu. Today leaded solder is not allowed by laws of many countries, particularly in the European Union and, even if you live in a country where leaded solder medium are allowed, you should consider using lead-free solder paste. Lead poisoning is something you should be concerned about, especially if you work in a home-lab. When absorbed by your body, lead is a cumulative poison affecting your health in several nasty ways. Lead poisoning is not easy to recognize and children are particularly vulnerable to lead, which impede their brain development. The main problem in using lead-free solder paste is the higher temperature needed for reflowing. When using lead-free pastes you need to use profiles with high peak temperatures (around 250°C) and you have to take special care to make sure that overshoots are kept to a minimum and timings are carefully respected to avoid damages to your PCB and components. When programming your reflow profiles, you should refer to the suggested profiles published by the producers of your solder paste and by the manufacturer of the components of your board. If you have no access to those documents and for general reflow applications you can always use the standard profiles published by JEDEC. The JEDEC Solid State Technology Association, formerly known as the Joint Electron Device Engineering Council (JEDEC), is an independent semiconductor engineering trade organization and standardization body. They published a few documents on reflow soldering with a couple of leaded and lead-free standard profiles you can refer to when programming X-toaster. By looking at the graph (JEDEC/IPC J-STD-020) you can easily understand that there is not a strict curve to follow, instead there are areas where to fit you profile. Even peak temperature (Tp) is not fixed for every situation, but changes depending on the packages thickness and volume. A quick cooling would be desirable to create finer grain structure and stronger joint. This is actually not always possible with toaster ovens where there are no exhaust/cooling fans. All you can do is simply open the oven’s door and wait until the temperature is low enough. On the table we can identify the maximum ramp up and ramp down rate (3°C/s and 6°C/s respectively) which, in our case, are not a big problem because you will hardly be able to obtain steeper rates with toaster ovens. What may be a problem instead are maximum time above liquidus (217°C, 60-150s max) and maximum time within 5°C of peak (Tp). If your oven is not powerful you could be forced to increase those values to allow temperature to raise enough. That is why choosing a powerful and small (quick) toaster oven is so important for reflowing. You should be able to reach more than 1°C/s when ramping up (ideally at least 1.5°C/s) with your oven. If you can’t you should consider another oven or adding more heating elements. As expected Sn-Pb parameters are much more “relaxed”. The most important factor is the peak temperature of only 225/240°C compared to the much higher 245/260°C of the lead-free profile. JEDEC recommends shorter time within 5°C of Tp and also shorter time above liquidus compared to the lead-free parameters, but if your application is not critical you should be ok with longer profiles. If your oven is not powerful enough for lead-free alloys and you are not willing to change or mod the oven, Sn-Pb may be your only choice for reflowing. We have seen that you have some kind of freedom to draw a profile suittable for your applications and your particular oven. At this point you really need to know what is your oven capable of, what kind of solder paste you will be using and which component sizes will be mounted on your board. Knowing the rate at which your oven can ramp up and cool down is easy enough using X-toaster controller. After setting up your oven, controller and thermocouple like suggested in the article "X-toaster Installation & Wiring", program a profile with a high Kp and a steep temperature rise (5s) to around 150°C and let it run for at least a couple of minutes or simply set the "Preheat until" parameter to 150°C. Your oven will be fired on constantly and you will be able to observe how much your oven is ramping. For the cooldown you can do the same in reverse: at the end of the previous profile set a steep cooldown to 25°C and make it at least a couple of minutes long. When the last phase start, open your oven’s door fully and you can observe at which rate your oven is cooling. You will probably find that your ramp up is around 1.5°C/s and you are cooling down at no more than 2 or maybe 3 °C/s. It would be pointless to program a profile which your oven will never be able to follow. Make sure to use the previous limits as a reference. 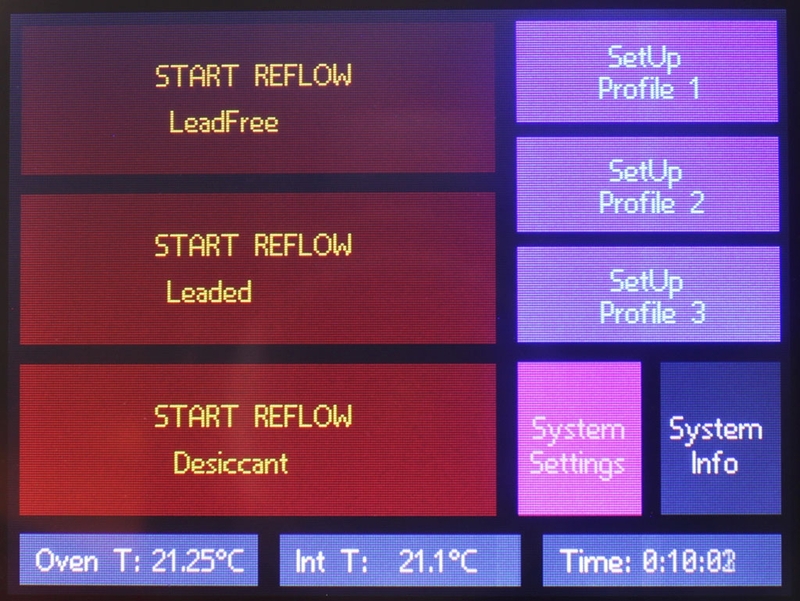 If you find that your oven is a little bit slow in the pre-reflow ramp-up you can tweak your profile to make that ramp a little bit easier, for example by using the whole allowed limits for the SOAK phase (150°C-200°C for lead-free and 100°C-150°C for leaded). Special care should be dedicated to the peak temperature. Once you know which peak temperature you a targeting based on your components size, draw a profile which respect the maximum time allowed for it and run a test. If you can, diminish the time within Tp as much as possible. If you observe overshoots try to use the Overshoot Compensation feature in the ADVANCED options. Of course you should also set the PID parameters. These are addressed in the "PID Tuning" article. User interface is provided by the LCD and four leds. Orange Mostly red when on. Power on, shows that the board is powered. Blue Status Led. Used for various pourposes, it is usually on when there are problems with temperatures and when a reflow process is running. From here you can check the oven’s temperature as read from the thermocouple, the onboard temperature sensor readings and how much time passed since the board was powered. 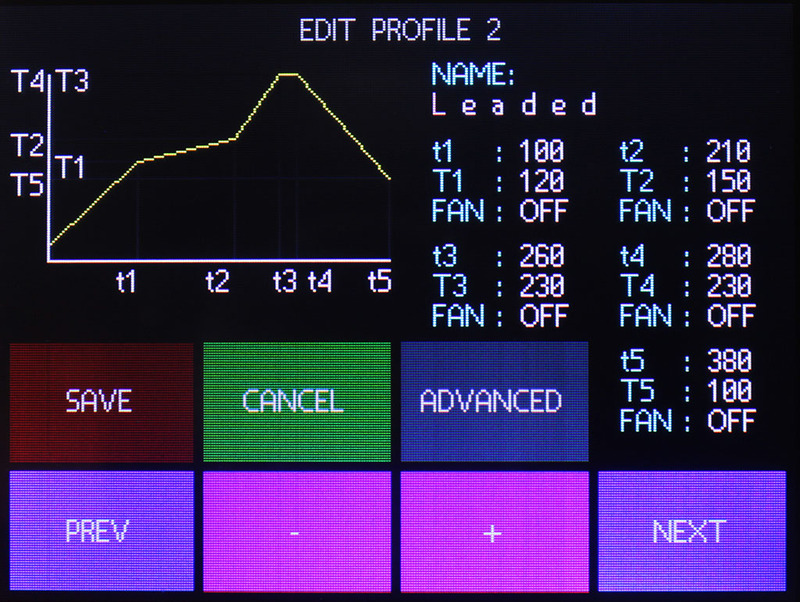 Three red buttons on the left will start the respective reflow sessions, while three blue buttons on the right allows the user to reprogram the profiles with their names and their advanced parameters. The purple button will allow to change general system settings and the grey one is used to overview some system info and all three temperature sensors. Each of these five nodes can be programmed with the desired time/temperature and for each of these phases you can sepcify if the oven’s fan has to be turned ON or OFF. You can move between the options using the “PREV” and “NEXT” buttons, values are changed with the “+” and “-“ buttons. The graph drawn on the top-left corner shows a visual preview of the profile you are programming and is refreshed whenever a change is made or when you touch it. When you are satisfied with your profile you can save it to EEPROM by pressing the “SAVE” button which will bring you back to the main menu or you can press the “ADVANCED” button to save it and enter another page in which you can modify the advanced parameters for that profile. Used to keep the oven ON from the start of the reflow session, discarding any PID result, until a certain temperature is reached. This may be useful to avoid big Ki summing due to starting inertia and to speed up initial heating. When set to 0 this control is disabled. Like the “Preheat Until” parameter this control allows to keep the oven ON during the RAMP UP phase but, instead of a temperature you can specify for how many seconds you want to discard PID results. This may be useful if you needed to use big Kd values to limit overshoots but you need to quickly heat up the oven to reach reflow temperature. This control is disabled when set to 0. This parameters starts acting when there are overshoots, lowering Ki at a faster rate than normal. Disabled when set to 0. 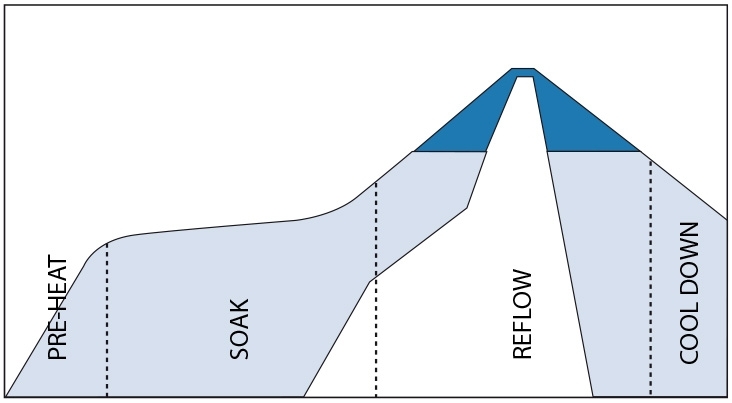 Since your reflow curve is going to be 5 segments delimited by the nodes, the “steepness” of the knees may result in overshoot and/or undershoot. This parameter helps in smoothing your profile by drawing another segment which replaces the knees around the nodes for the programmed seconds. When set to 0 this control is disabled. A big problem with toaster ovens is their large thermal inertia which leads to time lags of the output. If you can observe this kind of behavior by changing this parameter you can effectively shift your real observed curve ahead or later in time in respect to the target ideal profile. For larger oven this parameter give good result with values of 10~18, smaller oven having lower inertia may be ok with a value of 2~10. A little bit of testing is necessary to fine tune it. This control is disabled when set to 0. 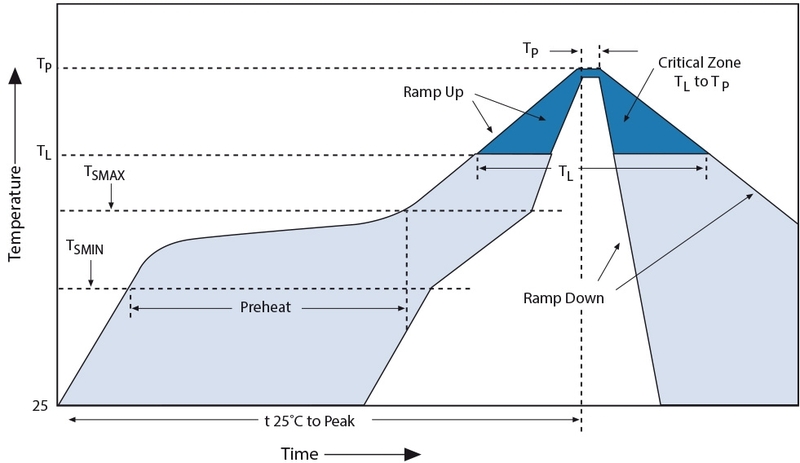 Like the Previsioning Parameter, Overshoot Compensation allows to compensate for thermal inertia in the REFLOW PHASE where usually there is a target temperature to keep and maintain for a given time. This problem is also known as Thermal Hysteresis: your profile is almost perfect but when it has to settle at a temperature it constantly overshot by a few degrees. Set this parameters exactly equal to the overshoot you are observing to compensate for it. This parameter is disabled if set to 0. Maximum temperature reading allowed from the onboard sensor before firing a Temperature Alarm and the user is askedto take actions. Same as onboard and external sensor but related to temperature read from the thermocouple. Thermocouple reading error is not linear over the entire temperature range, but if you can observe a fixed offset in respect to other sensors you can adjust it from here. It can be set both with negative or positive values. If, during reflow sessions, you want to display both the ideal curve (only defined by nodes), and the ideal curve modified by advanced parameters (except previsioning), by setting this value to YES you will see the ideal green curve, a modified yellow curve and the real measured values in red. 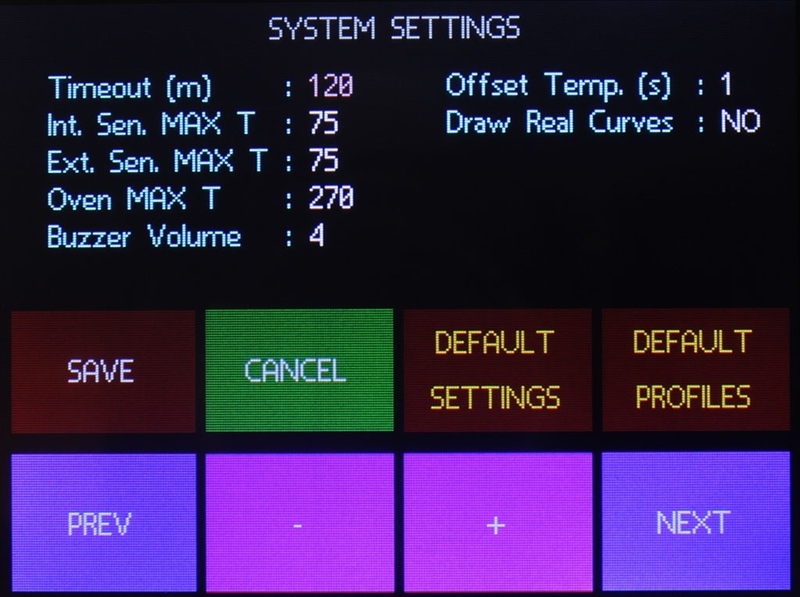 The "System Info" page will show you some information about the connected DS18BXX sensors and the stored parameters for the touch screen calibration. By pressing the "Recalibrate" button you will enter a page with a 5 points recalibration routine. If, for some reason, you mess up with the recalibration parameters and you are no longer able to enter this page you can shut down the board, touch the screen and keep pressing while the controller is powered up. It will automatically enter the recalibration page. 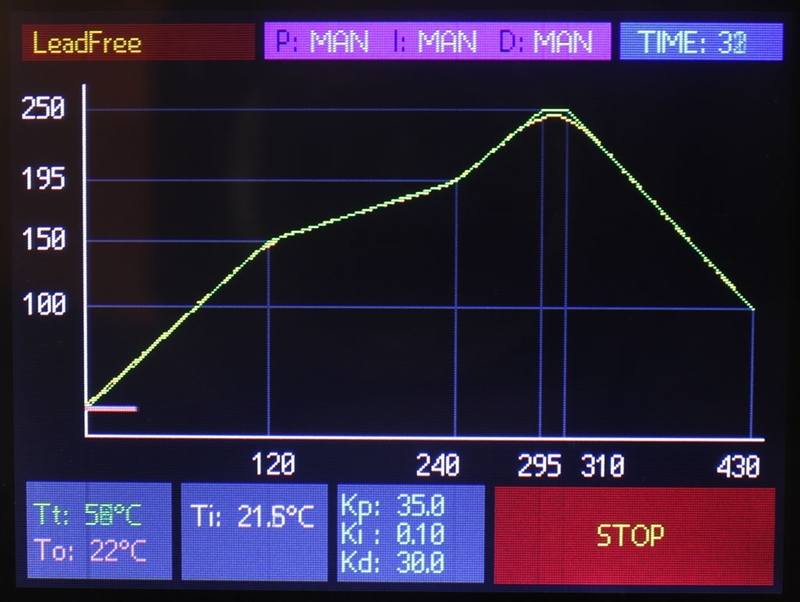 Reflow page is mostly occupied by the time/temperature graph in which you can confront the target ideal temperature (green) and the measured temperature from the thermocouple (red). You can also check the numerical values in the bottom left of the screen where in green you can read the ideal target temperature (calculated against the advanced parameters) and in red the measured temperature. The second grey square at the bottom left shows the internal and external temperature sensors values. On the third grey square, as a reference, saved PID constant are shown. The bigger red square stops the reflow process if needed. On the top left you can read the custom profile name, in the center the calculated PID parameter and at right time in seconds from the start of the process. Calculated PID values are a must when tuning your controller: by visualizing them you can see which one needs to be lowered or increased. During COOLDOWN phase the controller will ask to open the oven’s door. 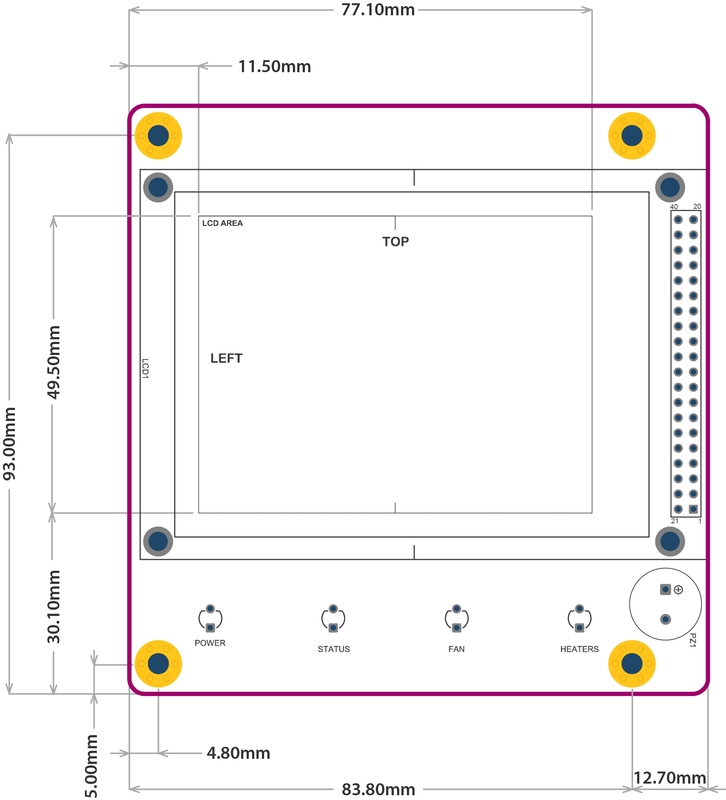 [box type="warning"]Please understand that, while X-toaster is a low voltage device and no high voltage source should be connected directly to the board, to build a reflow oven you will have to deal with mains power and connections. Mounting and using the controller involves two deadly hazards: fire and electrocution. X-toaster is not an end user product. Instead, it is a component which should be used to build a finished device (a toaster reflow oven). As such it is intended that you are a well trained electrical engineer who knows how to deal with mains power and industrial devices and production. Toaster ovens are not designed to be modded for reflowing. While it could be possible to fit the board directly into the oven’s chassis we strongly advise you to consider buying or building an external dedicated enclosure. 1) Temperatures inside the oven could become too high (above 50°C) and the board may be damaged by repetitive exposures to such temperatures. 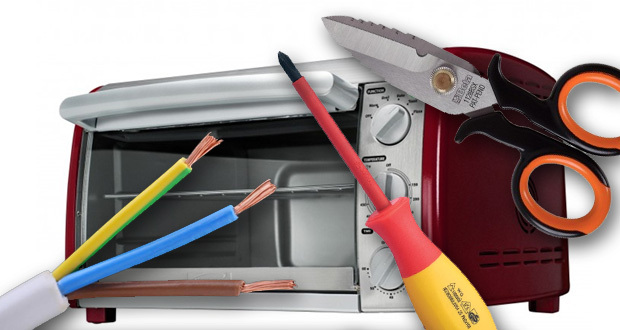 In fact, all electrical connections inside an oven are made with high temperature resistant wires. If you decide to mount the board inside the oven you should always use high temperature wires and you should find a way to insulate the board from the heat generated. 2) Apart from the board itself, you will have to mount at least an SSR with its heatsink and a power supply. Usually there is not enough space inside a chassis to mount all these boards and components AND the insulation WHILE keeping all the installation clean and safe with a sufficient air flow. 3) With such a small area inside the oven chassis it would be difficult to keep the right and safe distances from high voltages boards and wires and the low voltage controller part. As always think about safety first and try to imagine worst event that could happen, like an high voltage wires disconnected which come in contact with the controller board. If you are still willing to mount the controller inside the oven, you should at least use the onboard temperature sensor to ensure that the maximum temperature of 70°C is never reached (check “User Interface”). Even so, keep in mind that your board life will be considerably reduced. A slightly better option would be to install the SSR inside the oven and the controller in an external enclosure. Even when you do so, remember that the SSR we are supplying in our kit is rated for a maximum operation of 80°C, to keep it to a safe temperature you should use an external sensor (connecting it to the “EXT SENSOR”) and position it in firm contact with the SSR heatsink using some fastener to secure it in place and maybe some heat transfer compound. You should set the maximum temperature using the user interface to a maximum of 60°C/65°C. 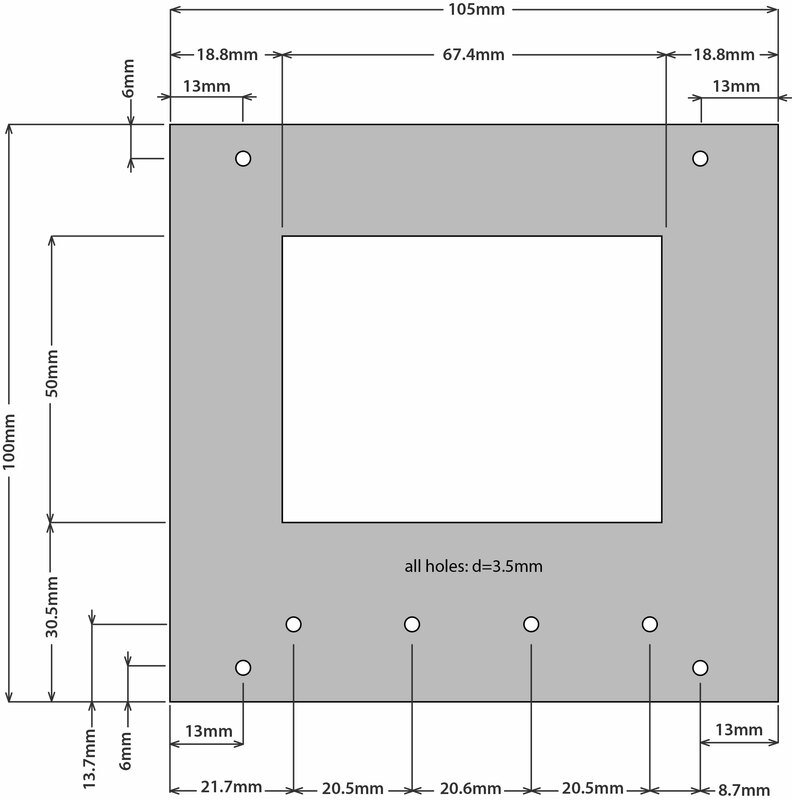 In another article you can find the layout for a front panel. You can use that drawing to drill holes and cut the LCD opening in the right position of your front panel. That drawing also indicates the minimum internal width and height of an enclosure to be able to accommodate the controller. 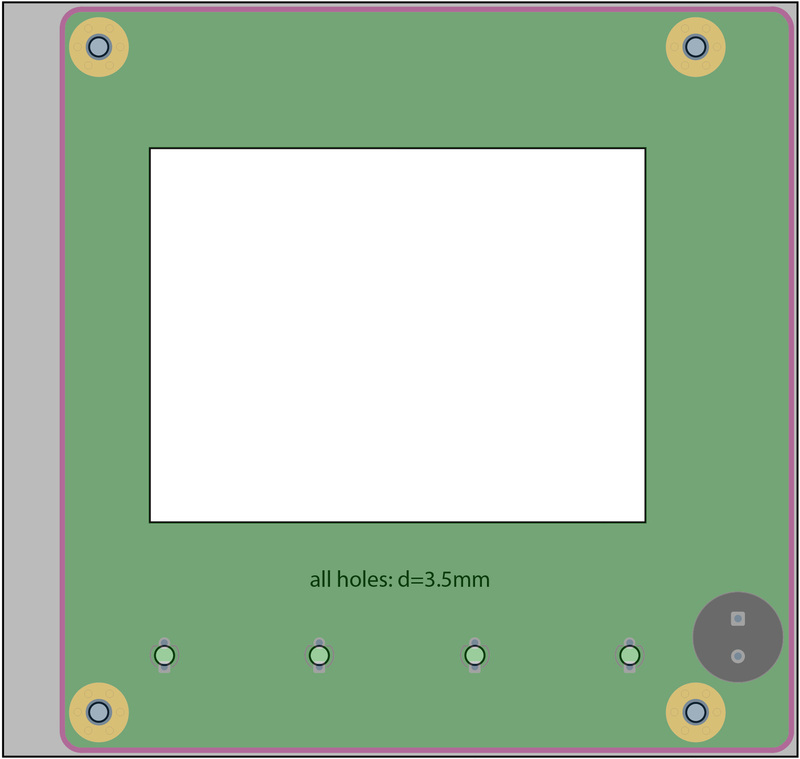 The minimum internal depth of the enclosure depends on which other boards and components you are going to fit inside it. If you are going to use an external 5V power supply (a wall cube) and you are going to mount the SSR inside the oven, the depth of the external enclosure can be kept to a minimum of 50mm/60mm. Of course having many smaller enclosures and devices around may not be practical so you would want to use a bigger housing and to mount everything inside it. 1) Use the right wire gauge and type for your connections, especially those involved in high voltage. Know how much power your oven is going to absorb and dimension your wires accordingly. 2) Keep your connections short enough to reduce EMI and power dissipation but long enough to create comfortable connections. 3) Use plastic strips to tie cable together in firm but unstrained positions. 4) Always provide for some kind of strain relief mounting to cables going out your enclosures. 5) For mains power and for all cables mounted inside the oven always use crimped connectors, never use soldered connectors. 6) Be sure to always connect to earth all metal parts involved in your enclosures and always double check those connections. These are your lifesaver when something go wrong: check them again! 7) if you can, use a metal housing (connected to earth). They are fire-safe, stronger than plastic and wood and provide better shielding and better heat dissipation. 8) make sure that all bolts and screws involved in your assembly are tight but not overtight. 9) always use a multimeter and check your connections as you go through the assembly and before connecting any power source. 10) inside the oven use only high temperature cables. In the kit you will find the right female connector which mates with the onboard male. Please note that it is a polarized connection and, even if the board is protected against inverted power, you should check the polarity of your power supply and connect it accordingly. To test the board you will also have to connect the thermocouple otherwise an “Hardware Error” will be fired. 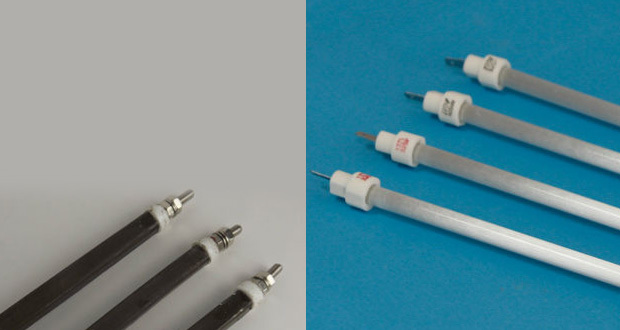 The thermocouple is a k type probe and it also have a polarization which you have to respect. Usually the blu wire goes in the “-“ and the red wire is to be connected to the “+” side. The HEATERS CTRL and FAN CTRL connectors should be connected respecting the polarity of your SSR: “-“ with “-“ and “+” with “+”. For a standard installation the PDI connector should remain unconnected. The EXT SENSOR has 3 pins: D (data), V (Vcc) and G (GND). You can use any DS18XX sensor or probe, you just have to respect the polarity indicated on the board. The SSR should be mounted on top of the heatsink using screws and the supplied compound. Note that the SSR "cuts" the brown wire which is the PHASE. The blu wire (NEUTRAL) should be connected straight to the oven. To crimp connectors to wires you should use a proper crimping tool. Avoid the use of pliers. If you decided to use an unmodded oven the only way to put the thermocouple inside the oven is through the main door. Make sure that the door remain as closed as possible but do not force it to avoid any damage to the sensor wire. The supplied thermocouple is not grounded, it is not possible to use grounded thermocouples with X-toaster. 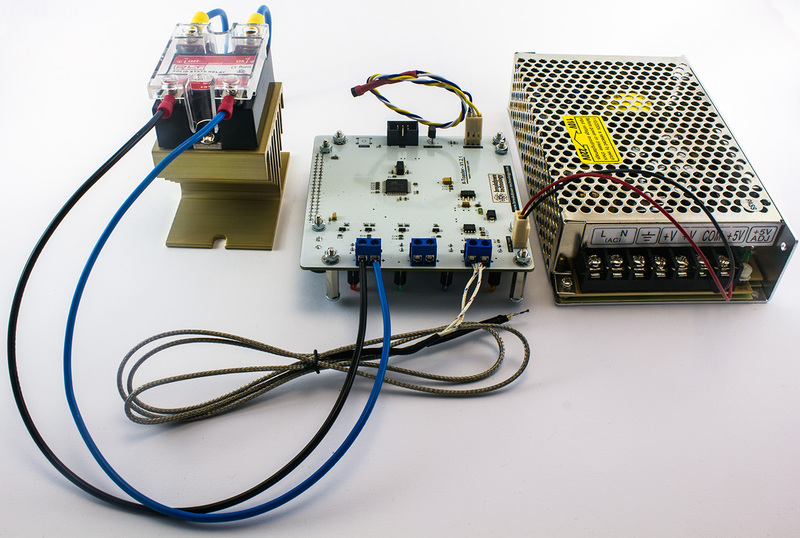 You can decide to position the thermocouple in free air or to attach it to a test board. We suggest you to mount the thermocuple in free air: this is the most common situation and it allows to directly use the profiles suggested in the datasheets of the electronic components on your board. If you need a very precise temperature reading you can use a test pcb similar in size and copper surface to the ones being soldered. The tip of the probe should be positioned inside a grounded via or a small plated hole of another test board, and secured with some kepton tape. You may also want to use a little bit of heatsink compound placed on the tip to ensure an optimal thermal conductivity. You do not have to mod your oven to be able to reflow your board. If you can turn on your oven from the knobs and set it to “always on” at maximum power, you can simply use the supplied power cord to connect the oven to the SSR and, in turn, to the controller. This is the simpler, safer and quicker method. If you do not have a good reason to start unscrewing the oven you should leave it “as is”. At least, before opening the oven and start modding it, you should try to make a couple of test to see if the oven needs some modding and to understand which kind of modding would be beneficial for you. - add more heaters to improve ramp up speed and reduce cold spots. - add insulation to improve ramp up speed and to easily maintain a steady temperature. Since you will be cooking some nasty things inside your oven you are going to need a dedicated oven for your reflow soldering. DO NOT COOK FOOD IN YOUR REFLOW OVEN! If you have an unused oven lying around you can try to use it before going out and buy a new one, but if you need to get a new oven there are some things to keep in mind when choosing it to buy the best you can for your job. Avoid the new electronics controlled oven with cool displays and touch buttons. You are not going to use those controls and you can save some money by getting a basic one with only manual controls. If do not plan to open and modify internally the oven make sure that you can turn it always on with the supplied knobs. If you want to reflow with lead-free solder paste there is the possibility that the thermostat of the oven will shut it down before the temperature you need to reach. If this happens, you will have no other choice than open the oven and bypass the thermostat control knob. As a general rule, keep in mind that, since larger ovens have more mass, they tend to heat and cool down slower than the smaller ones. In other words they have much more “thermal inertia” which is ok for cooking but definitely you want to minimize it for reflow soldering. Because of that, you may want to start searching for the smaller oven with the highest power rating you can find in the market. Something around 1500W for a small oven is almost perfect. 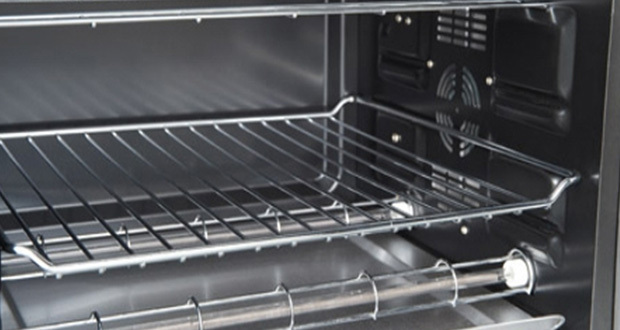 If you really need to use a larger oven you should consider modding it to add some more heating elements but before doing any modification check for your power outlets power rating. If you live in a country where the outlets have a standard rating of 110V/120V@15A you can’t draw more than 1500W and you cannot modify your oven unless you ask your energy supplier to install a 220V/230V power line. A circulating air fan is not needed but it may help to improve heat consistency across your PCB. 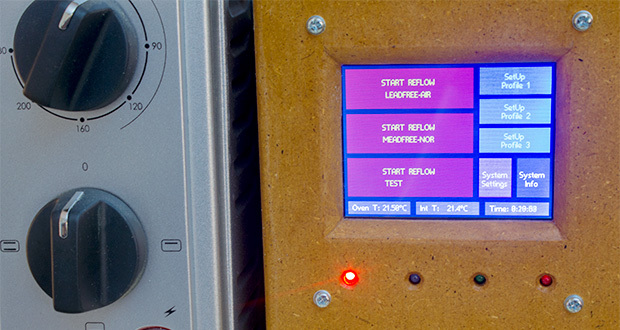 Industrial reflow ovens basically work by convection. They are designed to minimize radiated energy from the heaters and to use only hot air to transfer heat to the PCB with one or more fans which not only keeps the temperature gradient in the oven to a minimum but also draw the hot air out when there are overshoots and during cooldown phase. A toaster oven on the other hand works basically with radiated energy from the heaters and the small fans they usually come from are often not adequate to ensure a minimum heat gradient. In our tests, we found that sometimes they can help but, depending on the oven and the fan itself, they may cause problem during the liquidus phase. Sometimes they have strong vibrations and sometimes they spin too fast with too much airflow on small areas. Both of these problems usually results in the smaller components being moved out of their places. The only way to know if your oven’s fan is ok is to actually try it. For small PCB with small components you should be ok with the fan OFF. If you have bigger components you can try to turn on the fan during the entire reflow process. If your board has a mix of bigger and smaller components you can try to turn on the fan only during PREHEAT and SOAK. Also keep in mind that turning on the fan usually results in an increase of thermal inertia and tuning your profile may become somewhat harder and, if you plan to use an oven without having to open and modify it internally, there is no way to externally control the fan which is usually always on. There are two kind of heaters usually mounted inside a toaster oven: the classic ceramic heaters (the ones you find inside your big kitchen oven) and the newer quartz heaters. While both of them can do the job of rising temperature high enough for reflowing, quartz elements tends to heat up and cool down faster. This will improve the response of the oven to your reflow profile so, if you can, get an oven with quartz elements. The position of the heaters in the oven is also important. If you have only one heater on the top and one at the bottom you will probably have a few problem with larger boards with some hot spot directly under the heating elements and a few cold spot in the farther locations. Ideally there should be at least two elements on the top and two at the bottom. If you have to decide, it is better to have two heaters on the top and none at the bottom. This will drastically improve heat distribution but could also lead to warped boards for larger PCB (more than 10cmx10cm). Try to choose an oven which is adequate to the boards you are going to reflow. X-toaster has been designed to nicely fit in an enclosure with an inner width of about 100mm and it comes with a set of mounting spacer bolts which allows the LCD and the LEDs to sit at the right height when mounted on a front panel. Mounting holes and LEDs have been positioned around the LCD’s viewing area to provide a symmetrical appearance from the outside of the front panel. For this reason the board will be in an eccentric position when mounted in the chassis. All spacer bolts are M3 threaded. 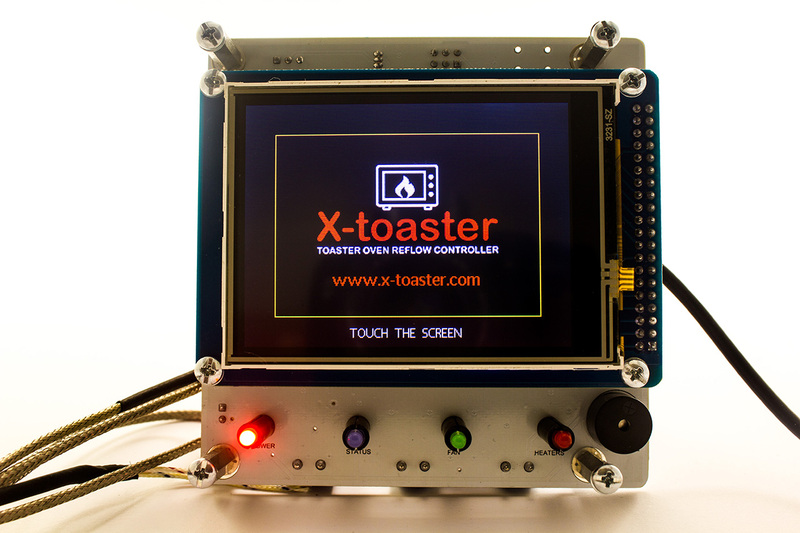 X-toaster is a controller board designed to convert any common toaster oven into an SMT reflow oven. It can drive two external SSR to enable control of the heaters and, if present, the oven fan. The heart of the system is an Atmel ATXmega128 which can be reprogrammed by the user through the onboard PDI connector. To amplify the signal coming from the thermocouple we selected the MAX31855 which supports any K-type non-grounded probe. There are three profiles stored in EEprom which can be modified and re-programmed whit your own, to adapt the system to various PCBs, solder pastes and ovens. 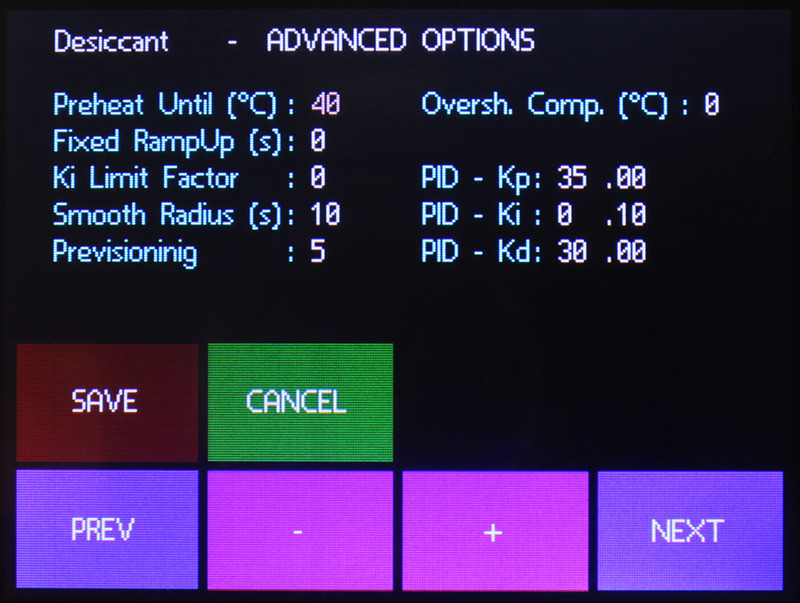 Temperature control is provided by a custom PID algorithm with some unique predictive feature to smooth any fast changing ramps in the profile and an exclusive overshoot compensation. GUI has been designed to work on a 3.2” color touch screen. 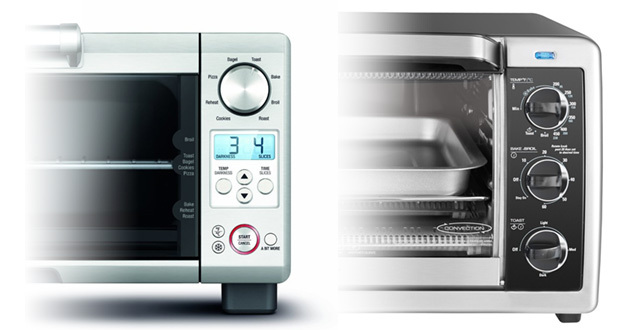 Safety features include a programmable timeout, two sensors to check for onboard and external over temperature, oven maximum temperature control, and hardware malfunctioning control.